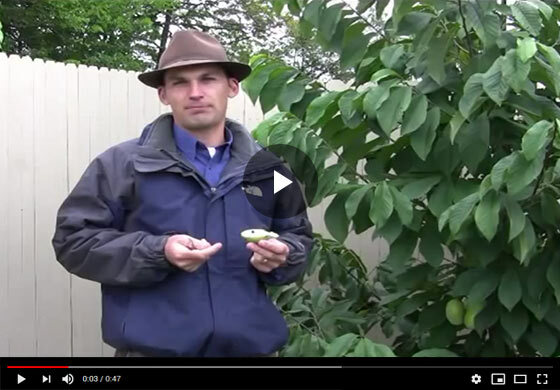 Gurney's horticulture expert Felix talks about the germination process of Pawpaw seeds, how it occurs in the natural environment and the practices to follow when looking to grow Pawpaws in the home garden. I'm Felix with Gurney's and I want to talk a little bit about a couple of points on Pawpaws. One of them is that when you plant a Pawpaw, you need to have two trees. They don't generally set with their own pollen very well. They like some diversity in their gene pool and so they want another tree to set the fruit. So make sure you plant at least two trees and if you're planting varieties, there should be two different varieties--if you're planting seedlings, two different seedlings will work fine. The reason that Pawpaw trees are generally understory trees and that you don't see them growing naturally in full sun locations has to do with the seed. Imagine this fruit falling down into the, onto the ground, a mammal would get at this and eat out the pulp. The seed is big enough that they can nuzzle that out of the way. Generally It'll fall into the leaf mold there under the tree and get surrounded by it and stay moist and germinate the next spring or if the mammal picks up the seeds and carry in little ways, it'll hopefully get into some leaf mold or something, some nice soil where it can get surrounded by some moisture. Again, cold period during the winter and it will germinate in the spring. If this seed dries out for even just a couple of days, germination drops way off from what normally is by a well handled seed ninety five percent germination, it would go down to five or ten percent. So it's very important to keep this seed moist for it to germinate.